Karl Lagerfeld, who died on February 19 at the age of 85, was a fashion icon and the revolutionary artistic director of Chanel. He leaves behind a momentous legacy — as well as his beloved cat Choupette, whom he famously loved more than anything else in the world. 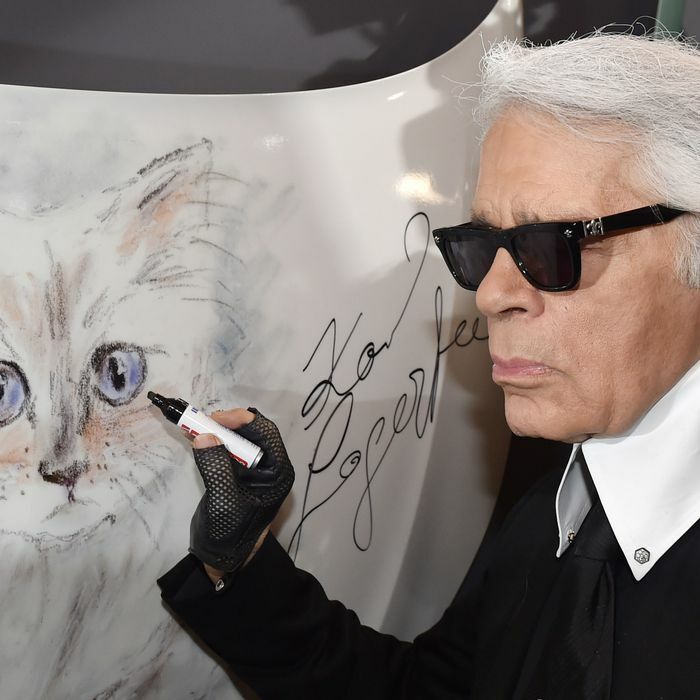 Lagerfeld took every chance he got to publicly celebrate his devotion to Choupette. The white Siamese cat first came onto our radar as an adorable kitten in January 2012 — after an image of Choupette was shared on social media, of course (in this instance, on V magazine’s Twitter feed). Soon after, Choupette had a social media presence of her own; first came a Twitter account, then an Instagram account that eventually amassed more than 120,000 followers. The Instagram account was inevitable. Choupette became such an integral part of Lagerfeld’s life that she was featured in fashion-magazine spreads and talked about by the designer in countless articles (including in WWD in 2012, when Lagerfeld recounted Choupette’s origin story: “She is an insupportable coquette. She is nine months old, so she is going through an adolescent phase. [Model] Baptiste [Giabiconi] gave her to me in December because he was so fed up with her constant flirting — can you blame her, though?”). Through her Instagram account, the world truly got to see Lagerfeld’s unwavering adoration for his cat. The pair traveled together on private planes (Choupette always got the best seat). We saw the cat’s personalized pillows, images of her and Lagerfeld snuggling, the extravagant gifts she received, photographs of Lagerfeld taking photographs of her, Choupette graciously allowing Gisele Bündchen to pose with her, and behind-the-scenes shots of Lagerfeld’s Chanel shows. Choupette’s glamorous life as Lagerfeld’s companion was so well-known, even Anna Wintour said at the British Fashion Awards in 2015 that she would like to be reincarnated as the cat. “I have often thought that in my next life, I would like to come back as Choupette, his extremely beautiful and bourgeois cat, who has two maids, a chef, a personal hairdresser, and many diamond necklaces,” the Vogue editor-in-chief said while presenting Lagerfeld with an award.